Tasting Marqueza port with maple chocolate shots at Harwood Estates. There are thirty wineries in Prince Edward County Ontario and during Maple Madness, 17 of them had interesting gourmet wine pairing events. How did people choose where to go?The wine connoisseurs would probably have headed for Norman Hardie. Norm was offering maple cured smoked salmon gravlox with his 2009 Pinots and Chardonnays or Closson Chase who were pairing Chard and Pinot with mini maple cured ham and cheese sandwiches. Rosehall Run could also have been part of that tour offering mini grilled maple cheese, caramelized onion and apples paired with their Chardonnay. The traditionalist wine tourists would have gone for the most well known county wineries, whose wines are available through the LCBO with a variety of price options. They might have started at Huff Estates for pork sandwiches with maple Dijon sauce paired with Chardonnay and gone on to The Grange of Prince Edward for a second Chardonnay tasting with mini pancakes and then dessert at Sandbanks where they were offering maple syrup pie paired with maple mulled wine or their Winter Harvest dessert wine. The wine touring family would have headed for Sugarbush Vineyards to explore the sugar bush, and make maple fudge s’mores over their bonfire. Then on to Waupoos Winery for lunch with maple cured ham and beans and where the kids could make maple taffy in the snow, and visit the baby farm animals. At both wineries all their wines were offered for tasting and maple liqueur at Waupoos. While in the vicinity, a trip to County Cider would have been in order for maple apple crepes with whipped cream and glasses of their fermented and non-fermented cider. For the wine tourist with eclectic tastes, Karlo Estates would have been a first choice, then on to two other Wellington area wineries Keint-he and By Chadsey’s Cairns , and finishing in Picton at Black Prince Winery .These are exciting wineries who aren’t afraid to take risks and have a variety of wine choices for all tastes. Even though you won’t usually find them in the LCBO, they have amassed a loyal following of fans. They all had delicious maple appetizers as well to try with their portfolio of wines. 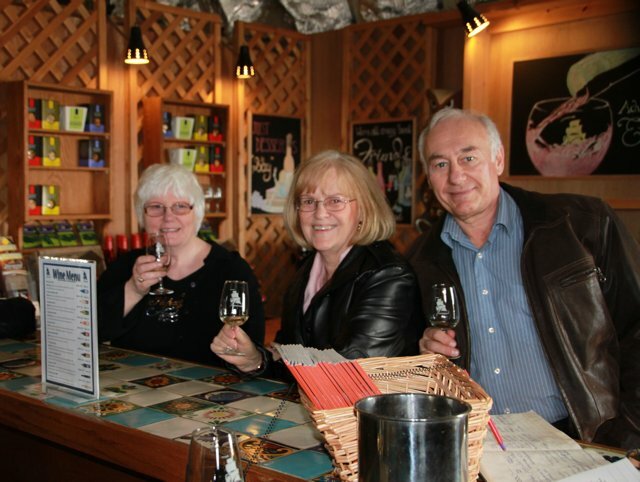 We invited friends to join us on a visit to Lacey Estates and Harwood Estates both wineries opened in 2009 and they are some of the friendliest people you could meet. Over the past three years the wines have gotten better and better with a range of choices beyond Chardonnay and Pinot Noir and it’s been great to watch them grow. The wine-soaked maple apple cake at Lacey and the maple chocolates filled with Harwood’s Just Desserts wine were additional enticements. I didn’t get to them this trip, but two newer wineries Stanner’s Vineyard and Half Moon Bay, would have fit in this same category of emerging wineries to watch. Which winery would you have visited for Maple Madness in the County? Leave a comment below about your choice to visit for Maple Madness and why.